These rosemary Parmesan cauliflower bites make a great low carb side dish or snack. They are full of flavor, easy to make and have only 3.2g net carbs per serving. I love cauliflower as you know. I eat cauliflower rice, mashed cauliflower and cauliflower cream in my soups and casseroles. 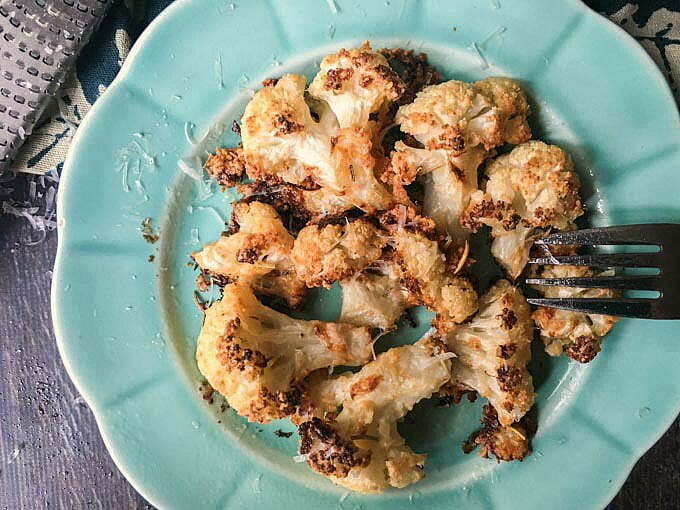 However I think the best way to eat cauliflower is when it is roasted. The roasting adds so much flavor to this vegetable and it’s a very easy way to prepare. So the other day for a side dish I made these rosemary Parmesan cauliflower bites and we ate it all! 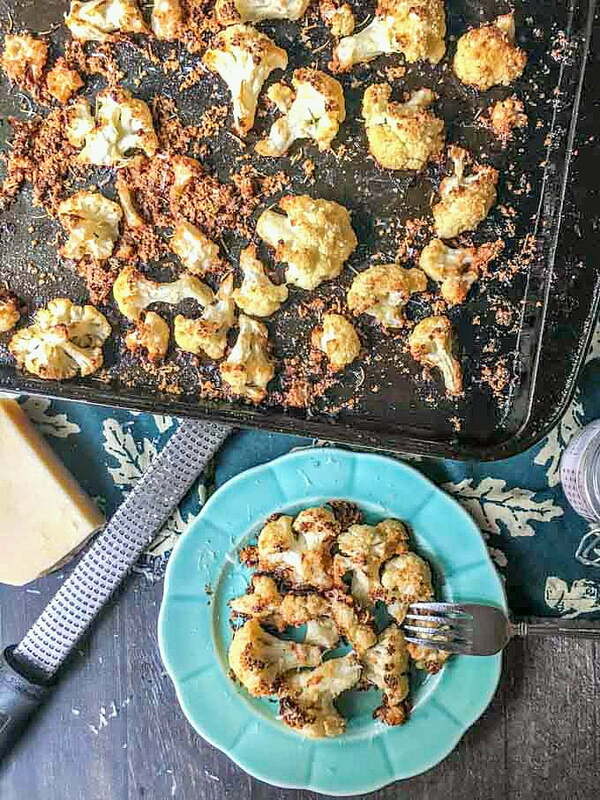 The rosemary and Parmesan go great together and coat the cauliflower pieces to make this a good low carb snack too. And it’s only 3.2g net carbs per serving. 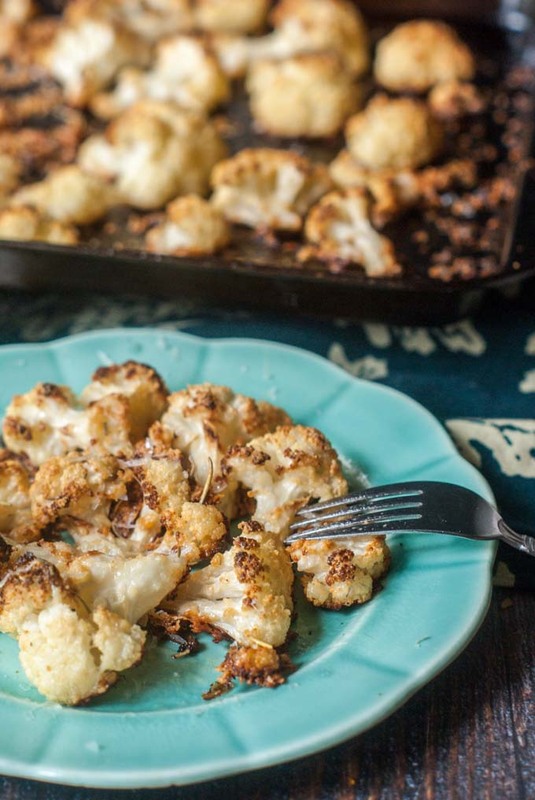 I have a bevy of cauliflower recipes on my site but if pushed to pick my favorites it would be the loaded mashed cauliflower and cheesy scalloped cauliflower. So you can see cauliflower is an excellent substitute for traditional potato dishes. And cauliflower is anti-inflammatory and high in antioxidants, vitamin C and vitamin K. You can read more about the health benefits here. So to make this cauliflower dish you simple mix the florets in olive oil and then sprinkle fresh grated Parmesan cheese and rosemary and mix again. Let that bake for 40 minutes until nice and crispy brown. And try to use fresh Parmesan if you can. I just bought a block of it at Aldi and grated it using my microplane zester. This really is a delicious low carb side dish but it would also be a great snack too. Especially if you are craving fries or popcorn. 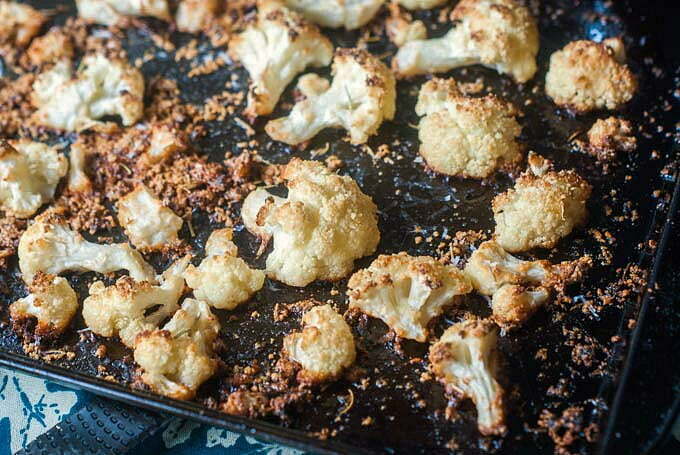 Toss the cauliflower florets in olive oil and then sprinkle the rosemary and Parmesan cheese over them. Mix well to coat. Spread evenly on a baking sheet and sprinkle salt to taste. Bake for 30-40 minutes until they are soft, brown and crispy. 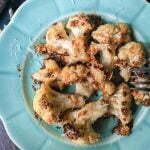 Love fried cauliflower. My mom made it all the time. these are not quite the same, but very tasty. Your mom was a smart woman!